Republicans have criticized it from the left, and they’re gutting it from the right. President Trump’s effort to repeal the Affordable Care Act has stalled. Despite the GOP’s big promises to “repeal and replace” Barack Obama’s signature legislation within weeks of taking office, Republicans have already blown their first deadline. The plan recently proposed by House Republicans would keep much of Obamacare but make it weaker and more costly, satisfying no one. It was introduced to withering criticism, both from moderates and the hard right. The biggest, most underappreciated problem for Republicans is simply that they ran against Obamacare, in effect, from the left, while all the concrete actions they want to take come from the right. What does this mean in practice? Conservatives talk compassion, but they really believe that the problem with health care is too much coverage. The GOP has repeatedly complained that the Affordable Care Act renders health care unaffordable. The monthly premiums are too high, and even if you pay them, the deductibles are also high. 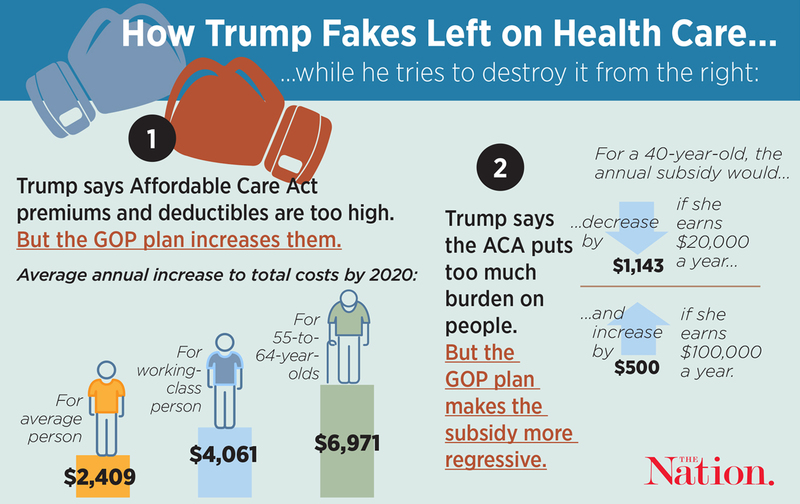 As Trump said in January, “You have deductibles that are so high that after people go broke paying their premiums, which are going through the roof, the health care can’t even be used by them because their deductibles are so high.” He’s not wrong, and you can understand why many people who rely on the ACA voted for Trump, assuming that his business experience would help him bring about better health-care access with lower costs. Conservatives complain that much Obama­care coverage comes through the expansion of Medicaid rather than private exchanges, and they propose throwing the baby out with the bathwater by scrapping the Medicaid expansion by the end of 2019—which would strip millions of the only health-care plan they can afford. They argue that Medicaid spending is too weak to produce a well-developed network of doctors who can afford to accept it, yet their solution is to slash funding even further. Conservatives talk compassion, but they really believe that the problem with health care is too much coverage, too little risk for individuals, and too much taxation. Commentators—including some conservatives—have flagged this contradiction as the central problem that will derail the GOP’s plan to dismantle the ACA: Washington Examiner reporter Philip Klein writes that if Republicans refuse to admit that they “don’t believe that it is the job of the federal government to guarantee that everybody has health insurance,” they will fail to make a case to repeal Obamacare. But voters won’t get to hear that, because Republicans already know that they won’t win if they articulate this belief. People like having health care. But progressives can’t just sit back and appreciate the tragicomedy of the GOP’s health-care efforts; these failures must serve as a warning to Democrats. Our representatives must not oppose Trump in ways that are easy in the short term but detrimental to long-term progressive goals. Consider some likely scenarios. Trump may run a giant budget deficit to create big tax cuts for the wealthy. Progressives will be tempted to jump on this—the last balanced budget was under a Democrat!—but given how low interest rates are, we should run a deficit. However, we should spend that money on infrastructure and public goods, not on giveaways that increase inequality. Or take trade policy—a difficult topic for any administration, much less one populated by an undisciplined and backstabbing staff. Trump will likely get nowhere with renegotiating trade deals or trying to tax imports, but we can’t just point and laugh—voters are hurting right now, and they want progressives to propose solutions. The arc of progress is long, but we shouldn’t bend it backward just to score points. We’ll regret it when we’re back in charge.